Mutual respect and trust is the key to lowering the barrier of antagonism and hostility between the Democratic People’s Republic of Korea and the United States of America – this is the message, simple yet meaningful, of the second DPRK-US summit. As a matter of fact, the June 2018 Singapore summit, the first of its kind in history, was significant in that it provided the groundwork of mutual respect and trust for the two hostile countries. It is undeniable that both sides cannot hope to achieve any good result unless they respect and trust each other. During the summit talks both sides shared the view that removing antagonism is the first step towards developing the bilateral relations in keeping with the aspirations of the two peoples. This historic meeting served as a good occasion for the two countries to respect, understand and trust each other. At the meeting Chairman Kim Jong Un and President Trump deepened rapport, taking a stroll and inviting each other to their respective countries at a convenient time. Mr Trump even showed Kim Jong Un the inside of his car. The cordial meeting resulted in the adoption of a historic joint statement. The months after the summit saw notable progress in the bilateral relations. The DPRK took proactive steps for easing tensions and ensuring peace in the Korean peninsula and also for its complete denuclearization. This was an important turning point in promoting mutual trust and improving the bilateral relations drastically. The two leaders’ respect for and trust in each other grew deeper. 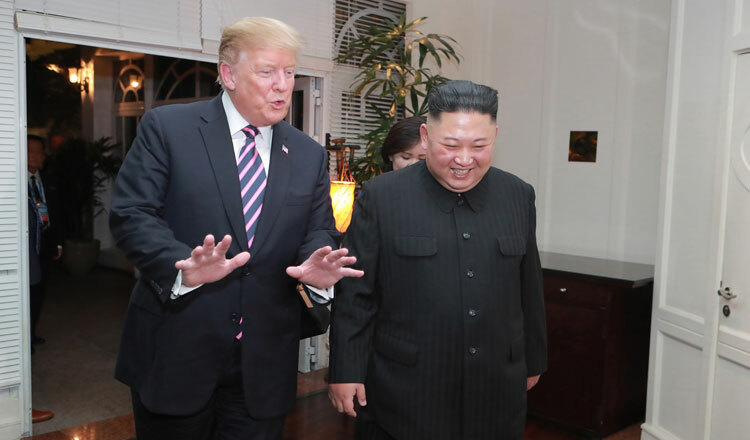 Kim Jong Un appreciated Mr Trump’s positive way of thinking and showed patience and goodwill. The latter revered the former as a hero. Such friendship led to the holding of the second summit. In Hanoi, after one-on-one chat, the leaders had a dinner in an amicable mood. During the one-on-one talks and enlarged meeting, they heard each other’s views on the issues that should be resolved without fail at the present stage in order to achieve the common goals specified in the Singapore joint statement and had an in-depth discussion of the ways to this end. They agreed to keep in close touch with each other for the denuclearization of the Korean peninsula and the radical development of the bilateral relations in the future, too, and to continue productive dialogues for settling the issues discussed at the summit. Indeed, the Hanoi summit marked a watershed in deepening mutual respect and trust, and in developing the bilateral relations onto a new high. The two countries will render a substantial contribution to ensuring peace and security in the Korean peninsula and beyond, if they understand, respect and trust each other, join hands and display wisdom and patience to achieve better results.